When I got a mail from Cycle World stating that I could fill out a form for a chance to ride one of their Ten Best motorcycles of 2011 in my city I figured, “Why not? Doesn’t hurt to try.” And I submitted the form away with happy abandon with the tickle in the back of my mind saying that nothing would become of it. A couple weeks later I was surprised to find a mail again from Cycle World. Apparently I’d been picked, and I could bring a friend. Neat! 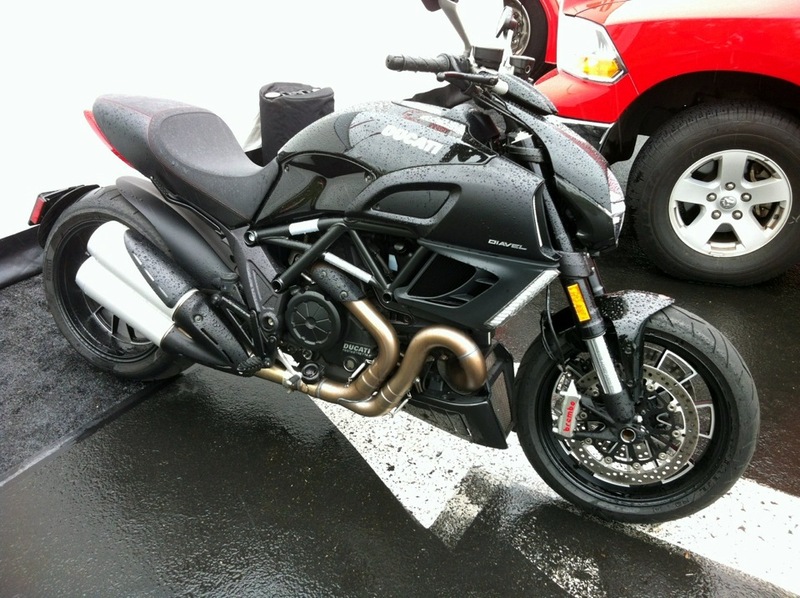 Oh, and we’d be riding the 2011 Ducati Diavel. Wait, what was that again? Still feeling it was a dream I put my prefered time and day in with my buddy’s name (whom had just been drooling over this bike only weeks before at the dealer). Then I started thumbing through my old issues of Cycle World to re-read what I could about the Ducati we were destined to be riding. 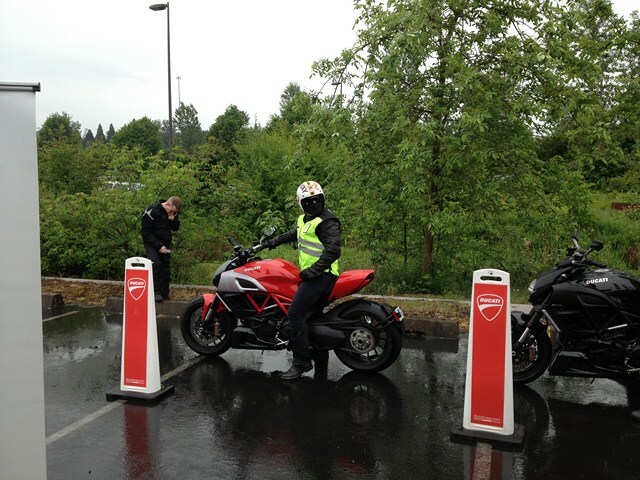 After registering and settling in, the staff from Ducati gave us a quick presentation and overview of the bike. Some features were truly amazing, especially for someone like myself who rides on 80’s technology most of the time. Drive by wire enabled a host of great features that really added in as much power, traction control and ABS as each individual rider would need to suit their style. To leave town they asked us to stay in the “Urban” mode which dialed the 100hp down from the full 162hp and put on a generous icing of traction control. This was easily switched on the fly via the turn signal cancel button and the LCD screen on the tank providing feedback on your choice. We got on our bikes to ride together in a large group. With the lead and tail we amassed a grand spectacle of Ducati prowess, totaling ten bikes in all. 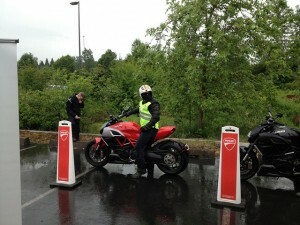 As we started the bikes, the familiar dirty growl of the 1198cc L-twin engines filled the air with their song. I don’t think any of us could resist revving the engines as we sat in line ready to go, grins across our faces. Finally we were off and headed out through town. The throttle response was amazing and metered out all the power I felt I would ever need. The brakes at low speeds however made me feel like I was going to do a stoppie every time I touched them, and thus I took extra care in using them. Even with the aggressiveness of the brakes, they never locked up or left me feeling out of control. As we continued out through town and onto the highway I realized the bike could do no wrong. With the electronic wizardry encased within the rugged exterior there was an element of finesse and balance which greatly increased this rider’s comfort levels. The bike sounded wild and out of control, but in actuality there wasn’t a single moment that I felt the bike was going to take me down. The power pulling out onto the highway, even in the 100hp “Urban” mode was enough to send tingles into my loins. This was a symbol of extreme power. I tried switching the dynamic power system on the engine to “Sport” while cruising along at highway speeds and then hit the throttle again. With the extra 62hp engaged into the power plant it was enough to just hang on for dear life and I clearly understood why they designed the seat with such a low slung socket for the rider. In some cases it might be all that keeps you actually on the bike during acceleration. Our group pulled off the highway and started hitting the twisties into the hills of west Portland. By this time I was back into “Urban” mode so I wouldn’t have to worry about all that power in the low speed corners. I didn’t expect the bike to be all that amazing in the curves, but it continued to surprise me. 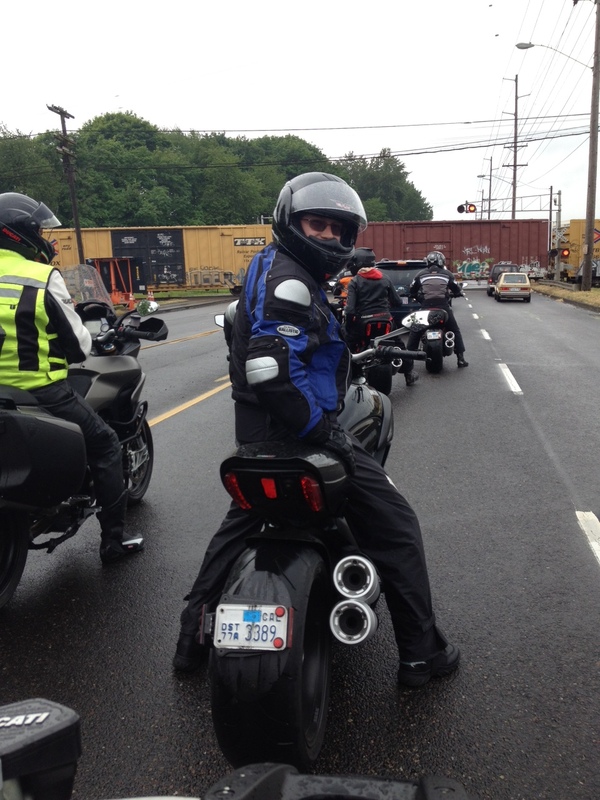 The Diavel casually handled all the lean and spirited riding I was willing to throw at it in the low speed corners that presented themselves in our ride. The one difference I found from riding my sport touring bike is that at a certain point in the lean with the Diavel, it would just stop leaning more. Almost like it was hitting a physical wall. I can only imagine this was for the best, as I would have been tearing up the pegs on the slalomed and bumpy road we were taken on. The bike dealt with it all in a very controlled manner, yet still underlying was the feeling that you were on a wild boar charging through the forest. It’s quite a unique mix of emotions that course through your veins as you take on the beast of a bike. By the end of our hour ride the bike’s performance and stability in every situation (you may recall, it was raining off and on all day) the Diavel delivered nothing but confidence to my riding. The ride itself was sportier that I would have imagined, but with all the right technology to keep the power of the engine, and yourself, in line. I appreciated the commanding view from the saddle in a fairly neutral relaxed position, where all you saw were mirrors and a hair of the spedometer/tach/indicator combo. Unobstructed, you were part of the world around you. This is a motorcyclist’s bike. There were a few items that I had issues with overall. No bike can be perfect for every rider, and we can all appreciate that. The large amount of engine vibration at lower RPMs made me keep the L-twin up over 5k. This made the 6 speed transmission almost laughable because at 70mph the RPMs were still too low in 6th and I down-shifted to get a smoother ride. Then the front brakes felt extremely sensitive. The slightest touch at low speeds felt like it would lock up your front wheel, though I can say it never locked or even hinted at it, there was only a degradation in confidence. Lastly, this is a rider’s bike. Taking a passenger or luggage looks like it would be out of the question for any amount of trip. Perhaps I’m looking for too much, and a cruiser should be for… cruising. Around town, out to the beach for the day, but not for making a trip to Alaska. 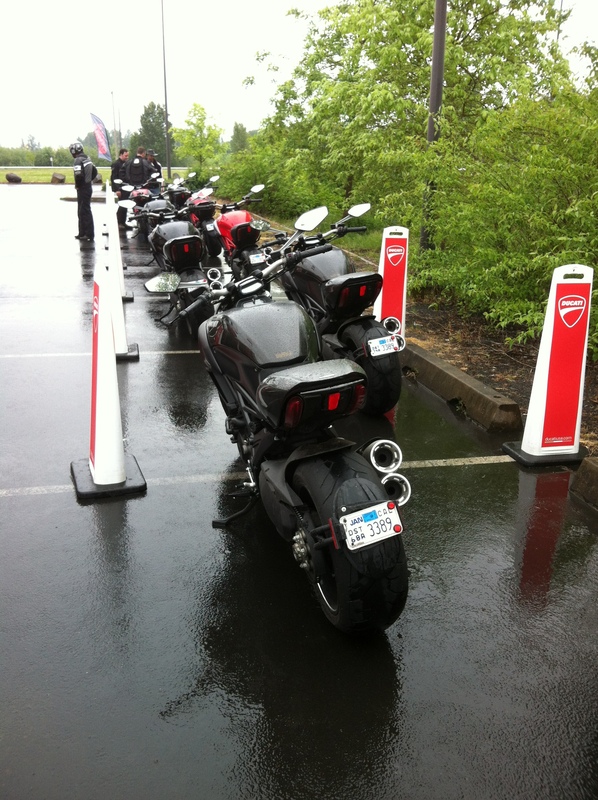 The Ducati Diavel was an impressive bike. Power that wouldn’t quit, but enough technology to let any level of rider tame the wild beast at their comfort level. Given the need for a slightly less practical bike it would certainly be tempting on my part. So much love and design has been put into this machine and it shows. 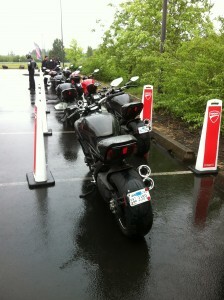 I had a great time and thank both Cycle World and Ducati for letting us have the chance to take these bikes out. I’m hoping that in the future, these types of events can allow riders to have a broader experience with bikes they might only ever get to dream about. 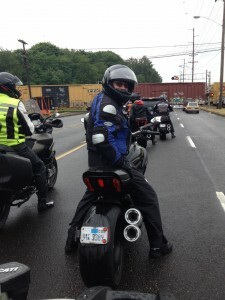 This entry was posted in Motorcyling and tagged Cycle World, Ducati Diavel, Group ride, PIR. Bookmark the permalink.